I am a big FMA fan and will often "force" my friends to watch it with me. 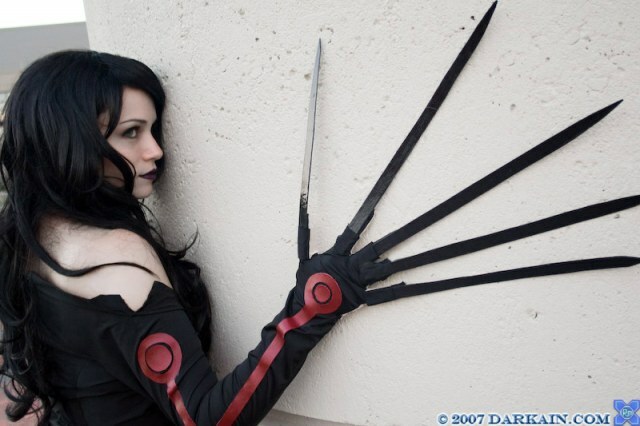 My friend at the time was one of my victims and, about half way through the series, he made a comment about wanting to cosplay Envy. I told him I would make his costume and he said that he would only cosplay if I did it with him. I laughed and joked that I would go Lust but only as excuse to make his costume. Well, the joke soon faded and the more I worked on the costume, the more excited I was to cosplay as Lust. The dress was made using a modified Vogue bridal pattern and the sleeves were lengthened significantly so that they could drape over my hands (to become the gloves later). I altered the top to make it a bit more revealing and used flesh-colored spandex to attach to the palms of the gloves, making the dress and gloves all one piece. The red shapes on the gloves are just glued on pleather. The nails were made from durable poster board and glaze and attach using individual finger "slips" made from the black and flesh-colored glove fabric. The tattoo was made with tattoo paper from Tattoo Johnny (which I HIGHLY recommend!) and the wig was purchased from ebay. I had fun cosplaying a character so unlike myself but I don't really like the type of attention it attracts. However, I loved experimenting with more dramatic makeup and surprising my friends with an unusual character choice.